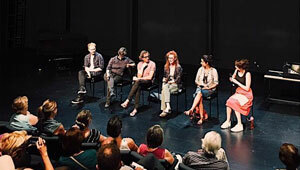 For The Testament of Mary, Resident Director Imara Savage, actor Alison Whyte, Composer & Sound Designer Max Lyandvert and Lighting Designer Emma Valente discuss Tóibín’s inspiration for writing the play, Alison’s approach to performing as Mary, and the design of the production. Hosting the Q&A was STC's Literary Manager Polly Rowe. 8:49 Why was the play written as a monologue? 10:34 What prompted Colm Tóibín to write play? 12:25 Will there be a live vulture?